Authored by trickyricky26 on Feb 10 2019, 4:08 PM. 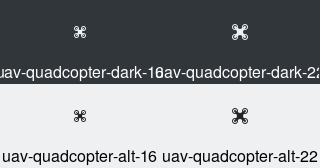 Add device icons for drones in 16px and 22px icons. Requested by @hein for his drone controlling endeavours. They are named uav-quadcopter with uav as a symlink to uav-quadcopter, in case we add a uav with more rotors etc. trickyricky26 added reviewers: VDG, hein. trickyricky26 added a subscriber: hein. From a distance, I wonder if those stationary rotors really connote the right thing. How hard would it be to make them look spinning, by replacing them with circles instead? I agree. I will experiment with different circles as rotors. Ooh, that is much nicer.